Lasers are used in numerous industries, with applications ranging across the defense, fusion energy, industrial, research, and medical sectors. Today, lasers are playing an increasingly important role in the development of many new processes, including guiding munitions and marking targets, missile defense systems, laser lightning displays, communication, and surgery and diagnosis functions. In basic terms, lasers are devices that generate intense light beams that are coherent, monochromatic, and highly collimated in nature. Lasers differ from other sources of light because they emit light coherently. Spatial coherence allows a laser to be focused to a tight spot, enabling applications like laser cutting and lithography. Spatial coherence also allows a laser beam to stay narrow over long distances. At present, lasers are used in numerous industry, commercial, and defense sectors. High-energy lasers such as CO2, solid-state and excimer are used in core industries such as material processing and automotives. However, with innovative research and development, lasers are playing an important role in the development of many new processes, including the use of beam energy over long distances. This is done to control vehicles, including power vehicles, so that they perform a desired operation, whether on land, in air, or in water. NASA at present is developing a prototype that is likely to propel vehicles in space. Scientists at Lawrence Livermore National Laboratory (U.S.) are involved in a phase to build a powerful laser based on fusion technology. Their research has indicated that this is the first step towards creating carbon-free unlimited energy. These developments and research expectations are expected to increase the market arena for lasers and to expand the areas of their application beyond traditional usage. Although the industrial sector seems to be experiencing a slowdown marginally, it still holds the major market share for lasers, while fusion energy is expected to create its impact on the laser market in coming years. This can be seen from the fact that scientists at the European Space Agency and NASA are developing a machine that, with the help of lasers, detects gravitational waves in space by detecting tiny changes in the waves. The machine is also expected to identify massive black holes and the formation of galaxies. Specifically, this post will address the individual markets for high-energy lasers -- lasers with a higher degree of photon output and coherence -- and mid-infrared lasers -- lasers whose energy rests between the low-infrared and high-infrared regions of the electromagnetic spectrum. High-energy lasers are used in core industries such as material processing and automotive. Mid-IR lasers are most often utilized in the areas of communications, spectroscopy, remote sensing, and measurement. High-energy lasers are lasers that have high power and intensity when compared to other lasers. These lasers are classified on the basis of their capacity to generate high range pulses within the same phase and can function according to the estimated time and targeted distance. At present, defense organizations and research centers at various locations are working to develop high-energy lasers for the benefit of society and to increase safety and power. Of all the lasers, gas lasers, which are used primarily in machinery and other fundamental material processing manufacturing, currently dominate the overall market with a share of 29.9%, closely followed by solid-state lasers with a share of 26.8%. Solid-state lasers are used in many high-end applications, including many that are specifically for defense purposes. Solid-state high-energy lasers have a wide range of spectrum (i.e., ranging from visible to infrared). As a result, they cater to a broad range of applications as compared to other types of lasers. According to BCC Research's High-Energy Lasers: Technologies and Global Markets (PHO015A), the high-energy laser market is expected to grow from more than $5 billion in 2013 to more than $11.2 billion in 2019, and register a healthy CAGR of 14% from 2014 through 2019. The market is segmented by type, including gas lasers, chemical lasers, excimer lasers, fiber lasers, solid-state lasers, and others. Solid-state lasers dominate with 29.8% of overall market share and are anticipated to reach nearly $3.3 billion in 2019 and register a 15.3% CAGR. Meanwhile, the gas lasers category is the second largest segment of the market with 26.3% share. The segment is predicted to grow to $3.1 billion by 2019, registering a CAGR of 12.7%. However, as a result of increasing utilization within the medical area, the excimer laser category, which was valued at just $188.5 million in 2013, is anticipated to jump to $466.8 million by 2019. In addition to medical applications, this type of high-energy laser is garnering increasing interest within the defense industry for weapons-based applications. Competitively speaking, the market comprises large and small players. However, the top five players have a market share of more than 70% in the overall market. Major players in this market include Trumpf (U.S.), JDSU (U.S.), Coherent (U.S.), Rofin (U.K), Cymer (U.S.), and IPG Photonics (U.S.). "Factors that support growth in the high-energy lasers space include the unmatchable high range intensity due to the technology's low divergence angle," said BCC Research photonics analyst Gaurav Bhushan. "As a result, energy loss in the overall path covered is also minimal and the laser attains a high level of energy. At present, there is no replacement for lasers in terms of their crucial role in industry, particularly in defense and medical/healthcare. This fact will drive growth in the industry for the foreseeable future." Mid-infrared generally refers to that electromagnetic spectrum located between the low-infrared and high-infrared regions. The market for this type of laser is primarily driven by the wide-scale application of mid-infrared in spectroscopy, remote sensing, and measurement. Use of mid-infrared in spectroscopy and remote sensing helps in identifying the elements present in various compositions based on the absorption property of the materials. Nonlinear sources, free election lasers, solid-state lasers, semiconductor lasers and CO2 lasers are some of the types of mid-infrared lasers. According to BCC Research’s Mid-Infrared Lasers: Technologies, Applications and Global Markets (PHO016A), the global mid-IR laser market is expected to reach $742.6 million by 2019, growing at a steady 8.2% CAGR over the 2014-2019 period. 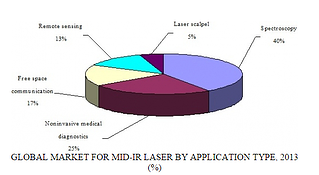 The market for mid-IR lasers, which is in the growth phase with many novel technologies in the developmental stage, is surging higher primarily due to rising demand for new detection technology and the increasing number of mid-IR sources. Key areas of application -- spectroscopy and free space communication -- are growing at a promising rate as well and have witnessed significant penetration of mid-IR technology. The defense industry continues to be the largest application segment with a 32.5% share of the overall market in 2013, while the research segment is expected to exhibit the fastest growth during the forecast period. CO2 revenue in 2013 and accounted for about 24.5% of the overall market in 2013. The semiconductor laser segment is expected to experience the fastest growth, with a CAGR of 12.4% forecast from 2014 to 2019. Mid-IR applications are found in various industries such as defense, medicine, healthcare, research, chemicals and others. The defense industry is and will continue to be the highest revenue-generating segment with $191.4 million by 2019, with a CAGR of 3.7% forecast from 2014 to 2019. The stellar growth expected from the mid-IR defense market is due to the wide application of mid-IR in illuminators, beacons, countermeasures and other devices. The research and chemical segments also are expected to experience high growth at CAGRs of 12.1% and 9.2%, respectively, during the forecast period (2014 to 2019). Because this is an emerging technology with tremendous potential and opportunities yet to be discovered, numerous companies are concentrating on launching new mid-IR products in the market. Frankfurt Laser Co., IPG Photonics Corp, Spectra-Physics and Thermo Fisher Scientific Inc. are some of the key mid-IR companies that have adopted product launches as their primary competitive strategy. "The mid-IR laser market is in the growth stage and has a potential of three to four times the overall laser market due in large part to technological innovations made by mid-IR laser companies," said BCC Research photonics analyst Pawan Kumar. "Technological innovations, such as the capability to operate at a room temperature and the reduction in size and weight, have directly influenced prices, leading to price reductions in the market. These factors have opened doors for a wide range of applications that were not feasible a few years ago."